I was back in Alberta last week visiting my parents. My dad writes a weekly column in the Cochrane Eagle and he asked me if I’d like to write a guest column for him. I said “sure” because asking me to write something is like asking me if I’d like a glass of champagne. I decided to do something on the lovely little creek that stitches together the parkland at the heart of the town. It’s on his website as “Our blue stream of consciousness joins past and future” with one photo by me, but since this is my blog and I have room, I’m going to give it to you here with four photos. Day by day, high and far on its edges, Cochrane grows. And instant by instant, in the town’s green heart, a blue past and future flows. 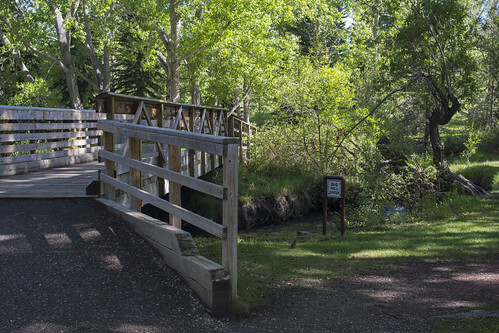 Bighill Creek comes to air above town and wanders down to see what’s here. It sashays past the old RancheHouse, swerves under a footbridge, swings wide, sighs at the glittering graffiti under the highway and slides under another footbridge and the tracks. 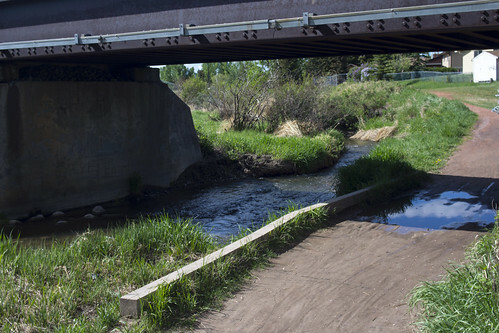 Nourishing grasses and trees as it passes, it ducks under Glenbow Drive and plays peekaboo with the red paths of Glenwood, William Camden, and Riverfront Parks: eight more bridges and two culverts. A jogger out with the dogs will cross it and cross it again, and again, and again. And then it becomes Bow water. 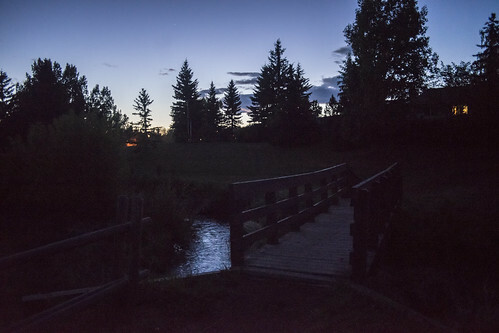 I visit Cochrane and the Bow Valley landscape of my youth every year, and every year I walk and run along and across Bighill Creek. 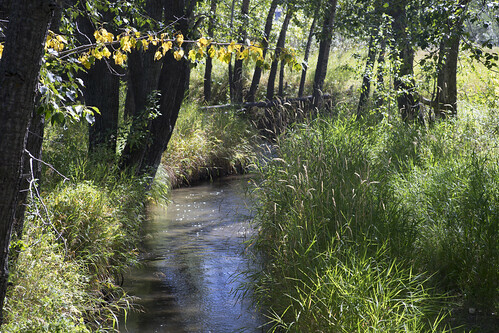 As I change, and the people I know change, and Cochrane changes, the creek is more or less the same, depending on the season – but, like any stream, its water is different from moment to moment. But it returns as I do, as the seasons do. Water evaporates from its surface and soaks the ground from its bed, and the plants it refreshes breathe it into the air. The water in the air dreams itself into clouds; the clouds rest down as snow and rain; the snow and rain feed the springs and the creek. And so, although most of the creek flows on like the countless instants we lose to memory in time, some of it returns. And after another year, I return. I am the same person but not quite the same, and Cochrane is the same town but not quite the same. I stand on a bridge and reflect on the creek. And the water flows by like mind into memory, some of it newly met and some coming back to me. I love wines. Especially good ones. From all over. Aina and I go on trips just to taste wines. My serious wine education started when I was 19 (thanks, cousin Sharon). For the past 16 years I’ve edited the website of Tony Aspler, Canada’s wine guy, and that was where I got the idea of doing word tastings. So, naturally, when I got the opportunity to write an article for a travel website about wines to choose for a starter wine cellar, I very happily took it. And I sure enjoyed writing it. Here it is. If you don’t enjoy reading it, have a glass of wine and try again (I recommend a chilled sparkling wine – a blanc de noirs from Champagne if you want to spend the money, or a Gloria Ferrer from Sonoma, or a crémant de Loire or, heck, why not Seaview Brut?). Good scholars always want to add to their skill kits, obviously, but they can sometimes be a silly set too. There are times when levity is the only sensible response to the gravity of the situation – to wit, when there is something that everyone knows, or that follows easily from something everyone knows, but no one has bothered proving. It’s not that citations bring excitation, but there is an expectation that if you say it you can cite a source for it. If it’s notable, it should be footnotable; absence of a note would be ominous. So when you are making a point in a paper, and you get to something that’s important to the point, and it’s an “everybody knows” thing or a “well of course” thing, but you can’t find prior research to support it, what do you do? What you want to do is footnote it with “Obviously” or “Everybody knows this.” But that seems rather… um… frank. Frankly English, for one thing. This is scholarship, you know! You don’t put “Smith, the same one I just cited,” you put “Smith, ibid.”; you don’t put “Smith, here and there throughout the book,” you put “Smith, passim.” So what do you put instead of “Everybody knows this” or “Obviously”? I’d be tempted to put res ipsa loquitur, a well-known phrase that means ‘the thing speaks for itself’, but it has a specific legal use – to wit: the very nature of a particular accident is evidence of negligence (i.e., that kind of accident can’t happen unless someone screws up). The fact that there is an existing English-style pronunciation for it tells us that it is in use as an English word.1 So we’re all set, right? Hmm, well. There are two English usages. One, no longer current, means ‘doubtlessly’ sarcastically: “Should Trump become president, he will scilicet brush up his diplomatic skills.” The other one uses it in another sense available from its construction: ‘evidently’ or ‘to wit’. That is to say, it means ‘that is to say’ – i.e., it’s another way to say i.e. It’s like a clickable plus sign that has expanded to show the extra information. So if you set scilicet the reader may be conditioned to expect just that thing you were using it to avoid: an explanation. Ah, drat. No rest for the learnèd. However obvious the thing, however needless an explanation seems to be, you can’t always conceal it, or skip it, or hope it’s too obvious for a note. Why not? Because, as Mark Twain wrote, “It ain’t what you don’t know that gets you in trouble. It’s what you know for sure that just ain’t so.”2 The great advances of knowledge have come from disproving the obvious.3 So you sigh and see what you can set down. Thanks to Iva Cheung for setting this thought train in motion. 2Actually, this can’t be found in any of Twain’s writings, though he did write “Faith is believing what you know ain’t so” in Pudd’nhead Wilson’s New Calendar. A similar quote is attributed to Twain’s contemporary Josh Billings: “It ain’t ignorance causes so much trouble; it’s folks knowing so much that ain’t so.” This likewise does not appear in Billings’s work. But Billings’s 1874 Everybody’s Friend, or Josh Billling’s Encyclopedia and Proverbial Philosophy of Wit and Humor has “I honestly believe it is better to know nothing than to know what ain’t so.” (Thanks to Bob Kalsey, http://wellnowbob.blogspot.ca/2008/07/it-aint-what-you-dont-know.html, for this.) In any case, the idea itself has an intuitive appeal and a certain… obviousness? 3If this doesn’t seem obvious to you, I can’t see why not. I think it’s time for another poem from my book Songs of Love and Grammar. This is one of a small set that have nothing to do with romantic difficulty – though it does have to do with getting around. Men chester and itoba – nah. in Canad and Americ as!